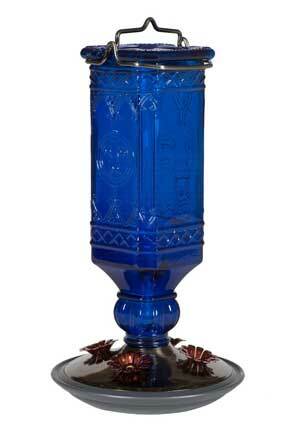 Cobalt Blue Antique Bottle Hummingbird Feeder features a vibrant blue antique bottle and a brushed silver base. The hardened glass nectar reservoir has a unique square shape. Four(4) red decorative flower feeding ports. The base easily comes apart and reassembles for easy cleaning. 32 ounce, ready-to-use. No mixing necessary! Ready to pour into feeders! Made with Sucrose sugar - The sugar that most closely simulates the nectar from flowers.